Drive Daytona GT 4 Wheel Scooter The Daytona GT 4 Wheel Scooter is the perfect mobility companion. It easily disassembles for transport in trunk or back of any vehicle. 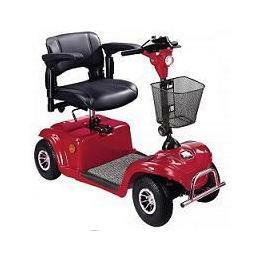 4-Wheel chassis allows stable ride for any rider up to 300 pounds. Daytona Scooter Features: For indoor and outdoor use. Easy to assemble/disassemble for transport. Contoured swivel seat is height and back adjustable. Seat features flip back and adjustable width arms. Top speed 40 mph and a cruising range of 20 miles. Comes standard with anti tippers. On board battery charger with easy to remove batteries. Large Carry Basket, easy to adjust tiller. Available in Red or Blue color.